Nature lovers in search of secluded and eco-friendly boutique hotels. Origins Lodge is an upscale boutique hotel in northern Costa Rica. Tucked in a hillside and inspired by pre-colonial architecture, this hotel is an eco-friendly option for those travelers who want to commune with nature while still enjoying the comforts of modern conveniences as well as gourmet meals. The experience at Origins has been featured in renowned magazines like National Geographic, and it’s easy to see why. Expansive greenery, lively wildlife, and disconnection from the outside world are all waiting for you here. Privacy and an exclusive feel. Great attention to detail. Gourmet dining. Meals are a unique experience prepared by a Michelin-starred chef. Resort feel. It’s a boutique hotel with only 7 rooms, so expect personalized service. Nearby towns. To visit Origins is to retreat from the outside world and into your own safe haven. Located in the rainforests of Bijuana, Alajuela, Origins is so close to Guanacaste it’s only 2 miles away from Tenorio Volcano National Park. Accessible only via four-wheel drive vehicles, Origins takes its name to the next level. Return to what makes humanity human and commune with the surrounding elements of nature. Comfort, amazing views, and relaxation are an important part of the experience. From the food you eat to the bed where you sleep, Origins makes an effort to showcase Costa Rican authenticity with everything they offer. After a journey across Costa Rica’s countryside, Origins welcomes you with a green-roofed lobby. Vines and ivy dangle out from the roof, merging the building with the hill into a seamless oasis. This highlights the hotel’s communion with nature. Everything from its architecture to the restaurant’s menu presents the beauty of the area and its natural wonders. Both the shared areas and bungalows are designed with various wooden structures in circular shapes, taking inspiration from one of Costa Rica’s pre-Colombian architectural styles. This shape is repeated throughout the landscaped gardens and furniture, representing the smoothness and connection to the world. Admire this delicate attention to detail in the artificial ponds covered in natural moss and the flowers in the hotel’s pathways. The open-air public spaces allow the breeze and view in whenever you are playing in the billiard room, lounging at the bar, or eating at the restaurant. The infinity edge pool is connected to the main building terrace, and it hangs above a line of rainforest and green plains. This is the perfect place to dine and enjoy the view. Watch the sunset from the restaurant while dining or fight the day’s heat from the pool. The rooms, on the other side, are exquisitely furnished, with both vibrant and earth colors clashing pleasantly and highlighting each other. The natural textures used in decorations and finishings bring up the best of the outdoors indoor, favoring sunlight and enhancing the feeling of being surrounded by nature. The canopy beds in the rooms are handmade, and the bungalows provide a 180-degree view of the forest from the terrace. Sit here to warm up a chilly afternoon with the in-built wood fire. If you need some quiet time, take advantage of the room service to enjoy a private meal. Origins provides world-class attention and service with its food, on-site activities, and spa treatments. It also incorporates local people, ingredients, and traditions to offer their guests authentic Costa Rican flavors and experiences. The hotel’s highlight is the surrounding forest. Origins encourages immersing yourself within nature for a complete disconnection from worldly worries. Waking up to the songs of birds is just the start. Head out and explore the scenery across the property’s trails, and enjoy the landscaped gardens with their bushes and flowers. Spot all kinds of birds, insects, and keep your eyes open for monkeys. Follow a naturalist guide across the forest and gardens to learn about the local flora and fauna, and make sure to stop and pick ripe fruit from the trees. Discover Origins’ beehives and learn about their non-stingy inhabitants from the beekeeper. If you are an early bird, visit the on-site farm during the morning along the hotel’s Michelin-starred chef, who teaches you about farm-to-table dining as he picks up the ingredients for the day. To truly relax, the spa provides detoxification treatments and massages to improve circulation. Don’t miss out on a sea-shell massage to stimulate your muscles and reconnect with your body, and the best part is that it takes place right outside under natural sunlight. If you are a bit more active, practice yoga and meditate in the corner that most calls out to you. Rebalance your body and spirit while listening to the forest’s sounds in a moment of peace as you strengthen your inner core. A yoga instructor is available to help and guide you whether you are an expert yogi or a beginner. For some, exercise is a key part of their decompressing process. If you want to pump it up and get the blood flowing, there are several on-site activities that are included in the room’s rate. The hiking trails are good for those in want of an invigorating walk in the rainforest. If you are feeling adventurous, follow a guide across these trails at night to discover all the nocturnal wildlife that hides in the bushes. The stables take good care of the hotel’s horses, and they are always ready to gallop up and down the hills. Explore the surrounding countryside on horseback and get the wind in your hair. If you like fishing, there are up to 7 lagoons where you can slow down the pace and catch tilapia, a local species. If you want to go even further out, there are caves to rappel near Celeste River, tubing, kayaking, stand-up paddle boarding, and a cacao & coffee tour to understand and taste these two iconic Costa Rican products. Whether you want to stay in, step out, or a combination of both, Origins Lodge is a good option for the nature lover in you. The hotel offers a farm-to-table menu, with all products being locally sourced or directly harvested from the hotel’s gardens or lakes. The chefs, Jean-Luc L’Hourre and Sullivan Leternuec, are both trained in French cuisine and work tirelessly to provide authentic Costa Rican ingredients into the guests’ dining experience. L’Hourre has received a Michelin star and he has helped craft meals that are spontaneous and surprising in the best way possible. Unique use of flowers and forestalls makes breakfast, lunch, and dinner a journey of flavors and sensations. Each day is a little different and foodies won’t be disappointed. 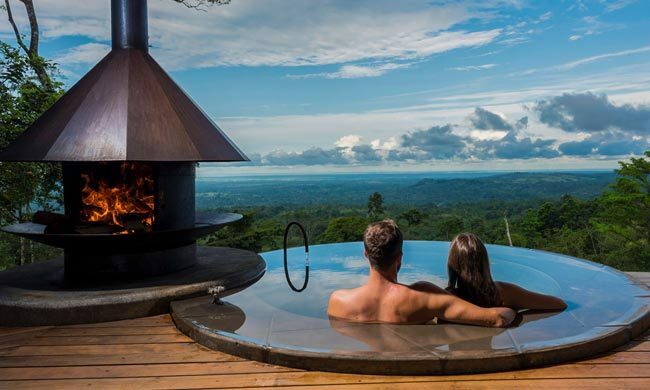 If getting away from the noisiness of the world while still enjoying top-notch accommodations and gourmet meals sound like heaven to you, then Origins is definitely an option for your Costa Rica Vacations. Simply contact us with any inquiries and we will gladly help you prepare for the vacation of a lifetime at this unique boutique hotel.